I watched out my front window as my son drove away on his way to work. As he approached the stop sign, I noticed that one of the brake lights was out. I knew an opportunity had just presented itself for a little father son bonding, automobile maintenance education, and a lesson in saving money. My son and I were going to change the burnt out brake light together. The first step was to determine what kind of bulb we needed. I had my son retrieve the owner’s manual from the glove compartment of the car. I flipped to the table of contents scanning for the vehicle maintenance section. Within those pages was a chart that listed the bulb type for each function of the vehicle. It listed the rear brake light type as 3157, which I wrote on a piece of paper and put in my pocket. I had to go to Walmart for a few things anyway, so while we were there we visited the automotive section and found the correct replacement bulb. A package of two cost just over $5. Once we got home, I had him search the owner’s manual for information regarding how to replace the bulb. In the same vehicle maintenance section, just a page away from the replacement bulb table, were instructions on how to remove the rear light assembly of the vehicle. Once that was complete, we were able to easily remove the old bulb, and plug in the new one. Once we got the light assembly installed back in it’s place, I had my son stand at the back of the vehicle while I hit the brake pedal. He gave me the thumbs up indicating the light worked. I called a nearby Jiffy Lube and got a quote of $8 to have them replace my brake light. The cost for me to do it myself was $2.50 for a single bulb (saving one for the next time). While $5.50 may not seem like a huge savings, the biggest savings was in time. I was already going to a store that sold the bulbs, and it took me less than 5 minutes to install it. Checking your vehicle’s lights periodically is a good idea. Changing burnt out bulbs yourself with the help of your owner’s manual is a great idea. Do you change your vehicle’s light bulbs? Have you ever looked to see if all the information you need is in your owner’s manual? I am a woman 72 years old. I took a car mechanics course at a school around 1980. I do my own oil changes, bulb replacement, keep battery terminals clean with baking soda/water,change my own wiper blades, fluids filled,keep the engine compartment clean and shiny.Due to the new technology in car and my age I no longer put on my own brake pads, and other things that require computer diagnosis. I do have my own OBD reader that I use when any lights come on the dash, usually a worn out gas cap.I keep exquisitely detailed records of repairs I pay for and know exactly what the repairs are, what they are for, and if they performed the job adequately.If they tell me something needs to be done that was just done I move on to a new mechanic. I have found wonderful honest mechanics. My car has over 112,000 miles on it and going strong. Some things I gave up due to my age. I open up my hood once a month for a quick once-over to make sure no leaks, and I check tire pressure regularly. I do the same for my husband because he doesn’t like to get his hands dirty–ha ha. Saved a lot of $ don’t buy new cars regularly, and I am thrifty and have a nice bank account saved from “paying myself” to do these chores I would pay someone else for. When I change oil $40 goes into my car fund. I am known in our household as “Mrs. Fixit” when something breaks they come running to me “can you fix this”. I usually can. I work full time and do a lot of my own maintenance on our house, so no excuses from anyone please. Let your son know he does not want to be beaten by a 72 year old woman! !Good thing is when you are busy doing this stuff it does not allow me time to go on endless shopping sprees to buy crap I don’t need. Win Win! 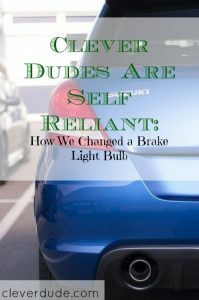 I’ve changed quite a few headlights, brake lights, and the like, and once you get the hang of it, the process is quite simple. @PW – You sound very self-reliant! I like your perspective that keeping yourself busy doing projects you don’t go on shopping sprees! That is truly a win/win! Thanks for reading! @MoneyBeagle – the first time is the hardest….after that it is a breeze. I took the car in for an oil change over the weekend and apparently a license plate bulb is out. They said they’d change it for $8. Uh, no thanks. I can do that myself.